At Glenside Hospital Museum we have artifacts from the period including two Thomas Splints and thee stretchers. There is also a collection of photographs and postcards showing soldiers in wards, in the grounds, posing with friends and medical staff, individual portraits, summer fetes, plays, musicals. Immediately one wants to know, who they were, what had happened to them, and where they came from. We are currently researching and collecting individual stories to shed light on what it must have been like. If you have a story please get in touch. Dr. J.V. Blachford, Medical Super­intendent of the asylum, was appointed Lieut.-Colonel, Commanding Officer. The nursing staff, all female were brought in. Miss A. C. Gibson as Matron and the War Office supplied sisters and nurses from Queen Alexandra’s Imperial Military Nursing Staff Reserve. By 1916, the trained nursing staff had been so depleted by drafts being sent overseas that members of Voluntary Aid Detachments(V.A.D.) were brought in. These women trained in preliminary first aid and nursing skills were as a group very much defined by being middle or upper middle-class young women, three quarters of whom had never had any paid employment. They were fondly nicknamed ‘Very Adorable Darlings’. The Female Infirmary block at the workhouse situated next to the asylum, was cleared and lent as a home for the sisters and nurses. The day rooms and the twenty-four night wards became medical and surgical wards. Corridors were refurbished to cope with emergency admissions, and two operating theatres were constructed of corrugated iron lined with patent plaster. In addition, the Duke of Beaufort consented to his name being given to the hospital. The greatest number of patients sleeping under the roof of the Beaufort War Hospital on one night was 1,487. 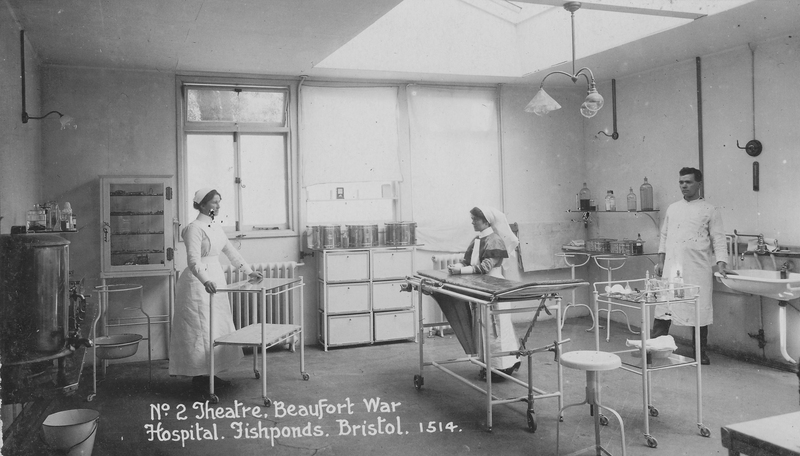 In the summer of 1916, Beaufort War Hospital became an Orthopaedic Centre for the district. Five hundred beds, including twenty for officers, were allotted for the orthopaedic cases. Men from distant parts of the world came to study the methods. Captain Moore from New Zealand and Captain Wace from British Columbia joined the staff, and soon a constant stream of American surgeons passed through the centre at Bristol to learn the work before joining up for service overseas or being put in charge of similar hospitals in America. Sometimes as many as six were working there at once. 29,433 patients were admitted and 164 deaths recorded, of which 30 were civilian emergencies from the influenza epidemic of 1918. The authorities tried to send men needing treatment as near to their own homes as possible, so many of the soldiers would have been local, however their was also a huge contingent of Australians and Canadians. You can see the Australian hat in many of the photographs of soldiers at the Hospital. 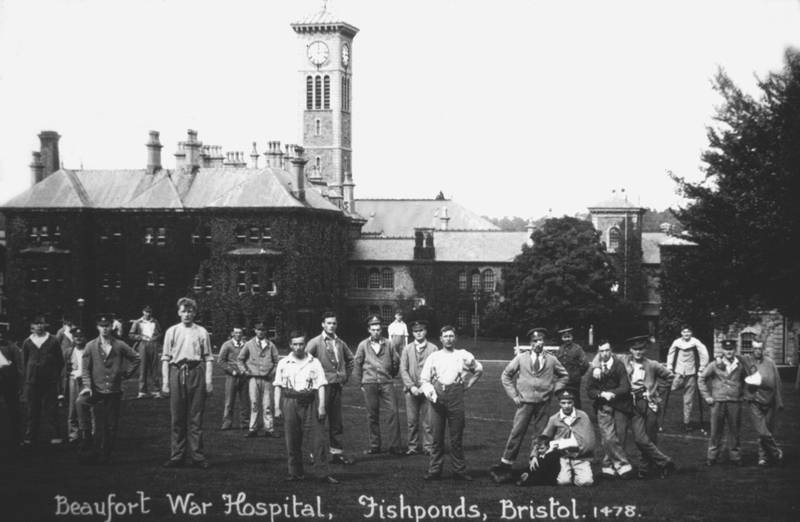 The sick and wounded soldiers would arrive by ship into Avonmouth and then travel by train to Bristol Temple Meads, often arriving in the dark in order not to reduce morale in the general population. Once they arrive at the Hospital, they were washed, treated and put to bed. George Pine’s memoirs published in ‘From Trenches to Trams’, by Clive Burlton. Although all the photographs are black and white, you can see some of the soldiers are wearing special blue flannel uniforms. 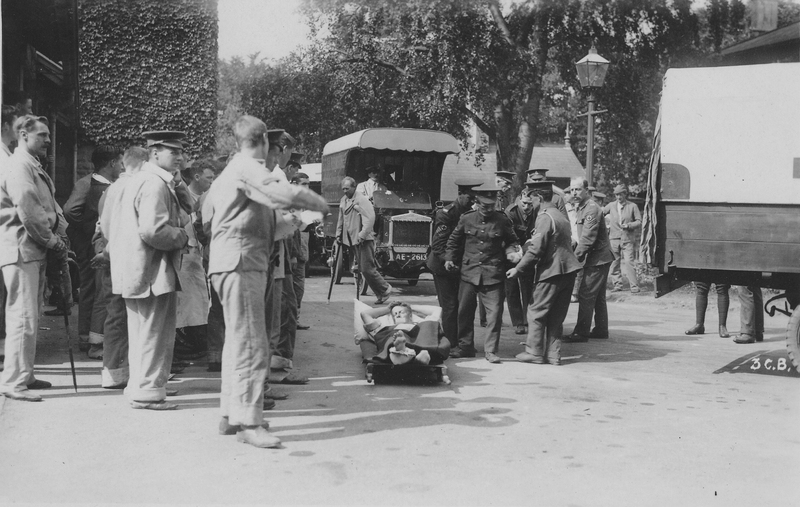 The ‘convalescent blues’ was a means of establishing and maintaining cleanliness in military hospitals, where soldiers usually arrived in dirty, worn-out and infested uniforms and ‘great coats’ that required sterilization and thorough disinfection. It also distinguished them as wounded soldiers if they went into town. The lounge-jacket and trousers resembled ill-fitting pyjamas, available in a handful of sizes so that it would fit all. 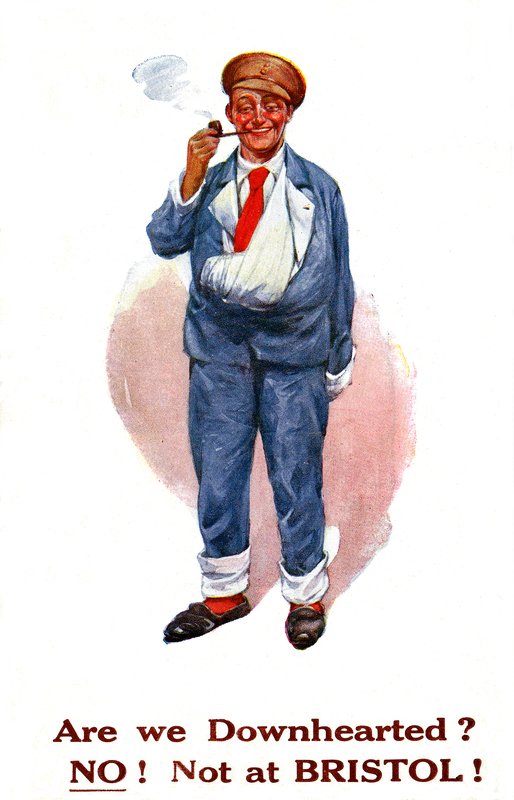 The convalescent blue outfit therefore fitted poorly, requiring soldiers to ‘flap’ or ‘cuff’ their trouser legs and shirt sleeves. The entire ensemble included a red four-in-hand necktie.